Nearly 400 miles into their Appalachian Trail thru-hike, Bekah and Derrick Quirin pack up camp and start the day. The tent gets broken down, sleeping pads are deflated, bear hang is retrieved, and one-year-old Ellie is strapped into her backpack to begin the day’s miles. 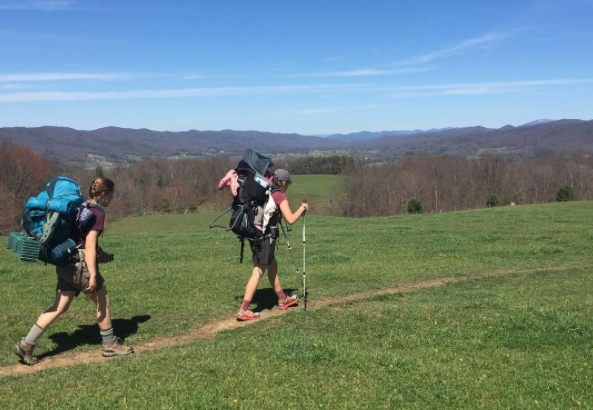 On March 20th, the Roanoke, Virginia family set out on their flip-flop thru-hike on the AT. Four weeks later, they are in high spirits, making good miles, and are remarkably low-key about the whole endeavor, which has been “easier than expected.” According to the ATC, thru-hiking the entire Appalachian Trail with a baby has never been done before, at least to anyone’s knowledge, making this journey all the more remarkable. 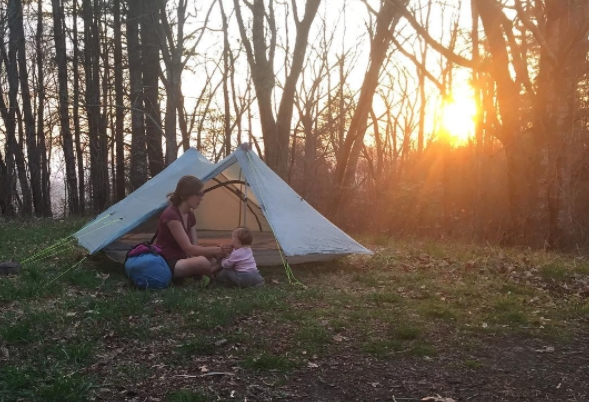 We caught up with Bekah and Derrick, who were kind enough to answer our genuinely curious questions about logistics, gear, and what life is like on the Appalachian Trail with baby Ellie. Where did you get the idea to thru-hike with Ellie? What made you think it could happen now? Last summer, we decided to move back home to Roanoke from Greenville, SC. During this transition we sold our house and a car and wanted to do something to grow closer as a family. With our backpacking background and our desire to get Ellie outdoors as soon as possible, we decided to thru hike the AT, which had been on our “to do” list for 10 years. We took Ellie on a few trips to test the waters and see if thru-hiking with her was an option. She absolutely loved the trail! 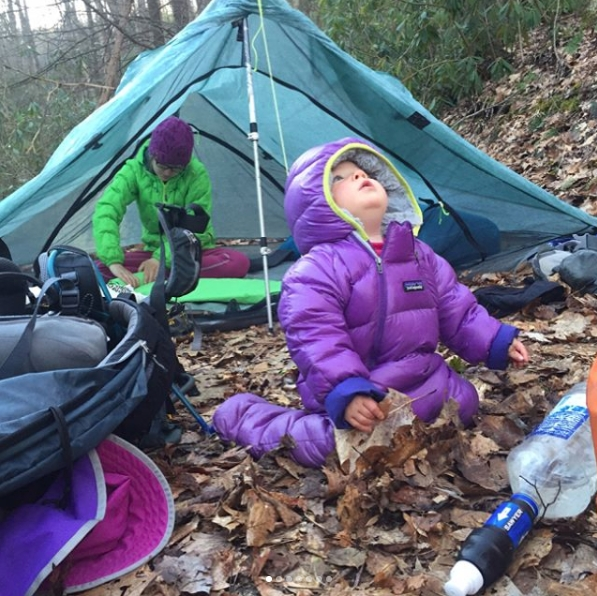 We did extensive research and talked to other adventure families and discovered that thru-hiking the AT was definitely possible with a baby as long as we were adequately prepared. What’s your hiking and outdoors background? Our first date was hiking! From here on out, most of our experience has been together. We both studied Outdoor Leadership in college then started working together professionally in the industry first as backpacking, mountaineering, and whitewater rafting guides in Washington. We then moved back South to guide day trips hiking and paddle boarding. We are also both Wilderness First Responders. What made you choose the AT? Derrick worked at Outdoor Trails in Daleville on the AT when he was in high school and really enjoyed meeting thru-hikers. From then, he’s always wanted to thru-hike. Bekah took a high school trip to New Hampshire to hike some of the AT with classmates and has wanted to thru-hike after discovering the White Mountains. What direction are you hiking? We are doing a flip-flop thru-hike. We started SOBO from Daleville, VA, then we’ll drive to Maine and continue SOBO. We’d like to be finished by Thanksgiving. This allowed us to be close to family in the beginning as we were making adjustments. We also get to meet a ton of thru-hikers this way—we pass most of the NOBO hikers twice, then we’ll start in Maine with the SOBO bubble. We love meeting other thru-hikers! The trail has taught us so much about parenting! We are learning to be super flexible and give Ellie tons of play time while also teaching her new things like how to walk, new words, and how to give a high five. This is all in addition to hiking 12-15 miles a day together. Thru-hiking the trail with a baby has even been a lot easier than we anticipated, but it helps that Ellie has a very relaxed personality. What are your top three considerations before you start each day? 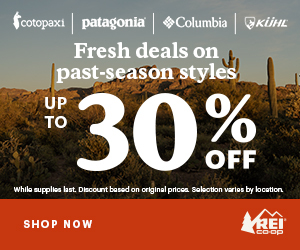 The top three aren’t much different than any other thru-hiker! When and what are we eating, where are we sleeping, and where are we getting water. What gear are you carrying? Anything specialized for Ellie? We use a ZPack Triplex tent which is just the right amount of space for two adults and a baby or small child. Bekah uses the Deuter Kid Comfort III carrier for Ellie. Our sleep system is two large Therm-a-Rest NeoAir pads linked by their coupler sheet, with their down double quilt over us. This system is about the same size as a double-sized bed, which is plenty big and warm for all three of us as she sleeps between us. Most gear is shared in order to cut down weight. We share our cooking system, the sleep system, food, water, toiletries, etc. Ellie has wool layers, a down Bunting, and a full waterproof rain suit! How is the pack load divided up? Bekah carries Ellie and her diapers, the rain gear, and snacks for the day. Derrick carries everything else. We use GDiapers that are a combination of cloth and disposable liners. We have these along with wipes sent to resupply points on the trail for 3-5 days worth at a time. 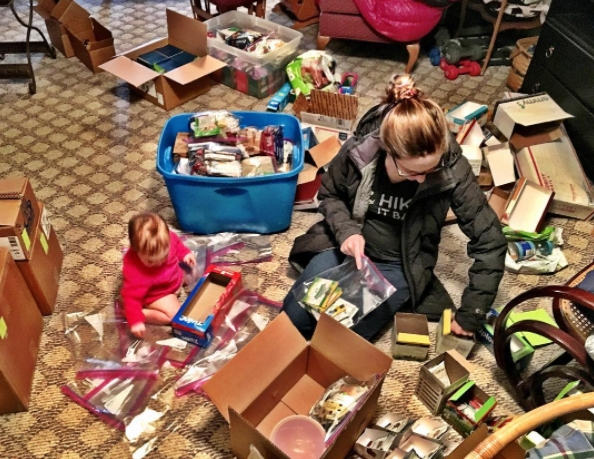 We pack out the diapers and wipes with any other trash we have. What is your food strategy? We cook healthy breakfasts and dinners that can easily be mashed for Ellie to eat with us. Lunch and snacks are easily broken into bite size pieces for Ellie! We all eat the same food. Does Ellie’s sleep schedule coincide with hiking? Ellie goes to sleep with us when the sun goes down about 8:30, then she takes her naps while she’s in the backpack as we hike. The system works amazing on the trail, but is difficult during zero and nero days because she’s used to being lulled to sleep for naps in the carrier! Do your hiking plans differ for the AT’s more extreme terrain? Yes, we plan to slack pack some and have a few contacts “on call” in areas. The AT has an insane density of towns, but do you have backup if something happens in the rare instance you might be several days from a town? We keep a SPOT with us and send the “ok” message every night to family back at home. It can be used for an emergency if necessary if there is no cell service, but we have found so far that the trail frequently has cell service. Has anyone questioned this journey, or has the response been positive? The response has been extremely positive from thru hikers on the trail! The other hikers enjoy Ellie’s happy smile and joyful personality. 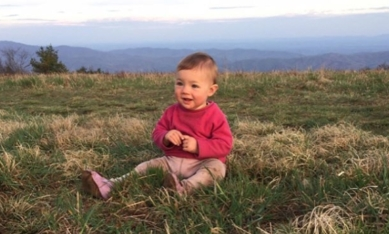 Most outdoor enthusiast parents understand the if you’re aware of your surroundings, aware of your baby’s needs, and take precautions along the way, the risks on the AT are minimal. Follow Kanga, Roo, and Sherpa on Instagram: @ellieontheat. Check out their blog here, including a sweet intro video. We met up with Bekah, Derrick, and Ellie at the Laurel hostel off rector Laurel road about three days ago. Wonderful family and a pleasure to talk too. They are certainly an inspiration! I love all of Ellie’s updates! So inspired by this family! Ellie will benefit from this experience for her entire life, as a formative event, I can’t imagine better! It was so cool to meet you guys. you are Amazing people, and why I love the AT. But for sure, neither of these families went the whole distance from Springer to Kathadin !